The heart has long been appreciated as a vital organ in the body, one whose persistent beating sustains human life. During the Middle Ages, the heart fell under the scrutiny of a variety of philosophers. Some, like Aristotle, reasoned that the heart, not the brain, was the important organ of the body that dictates human reasoning and rationality. Others believed the heart held different responsibilities as the seat of the soul, a place of emotion and passion. The heart as a representation of love has survived especially through the heart shape, a symbol that has been prominent since the end of the Middle Ages. The simple heart shape has become a metaphor for affection, for lust, for devotion. As the image primarily associated with Valentine’s Day, it remains powerfully resonant of love. In Othello, Shakespeare alludes to the importance of expressing such emotion with the phrase “I will wear my heart upon my sleeve.” The phrase once referred to the jousting tradition where knights wore colors that matched their respective ladies. Now, this idiom alludes to displaying emotions openly and fearlessly. 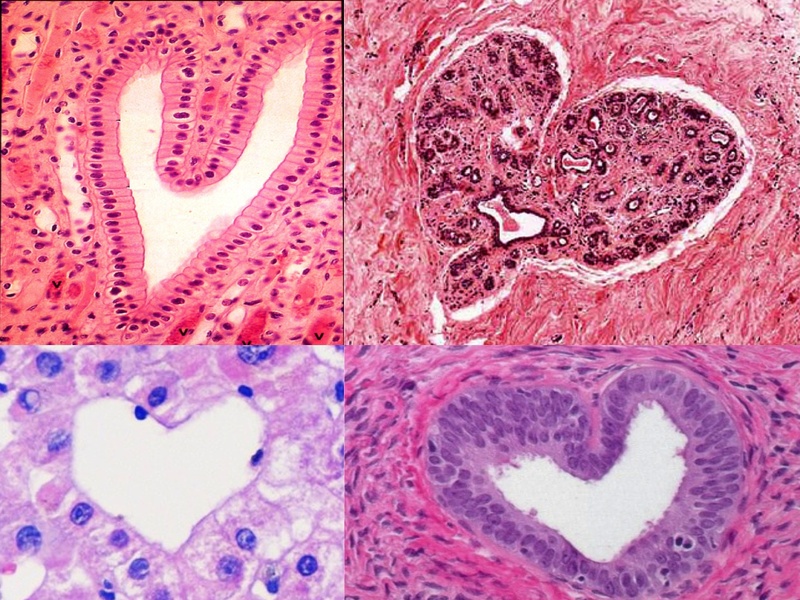 This collage, motivated by the recurring appearance of the heart shape in non-cardiac tissue, demonstrates how the heart shape we so commonly associate with love can in fact exist outside the organ of the heart. Taken from kidney, mammary gland, liver, and prostate gland tissue, these samples demonstrate how the heart shape lives on structurally in other bodily organs. These hearts are constructed with different kinds of epithelial tissue from simple cuboidal epithelium to simple squamous epithelium; different cells come to naturally construct the heart shape. The array of colors arose from the different dyes used to illustrate the tissue structures. The basic dye hematoxylin binds to basophilic components like nucleic acids and ribosomes, while the acidic dye eosin binds to acidic components like protein. Although the heart shape is embodied differently in these various organs, it maintains the basic structure of two symmetrical halves that coalescence to create a whole. I was honored to be selected as the Grand Prize Winner of the Science as Art Contest for this artwork and description. This content is licensed under a Creative Commons: Attribution-NonCommercial-ShareAlike license (CC:BY-NC-SA).